Volunteers who help care for the Lake District’s mountain paths are celebrating after receiving a funding boost. 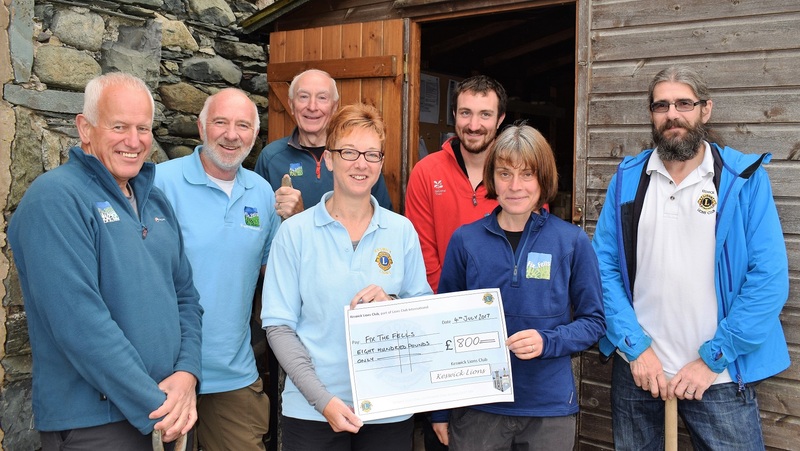 Keswick Lions Club has donated £800 to Fix the Fells’ volunteers in the North Lakes – and the cash will be used to buy tools such as shovels, mattocks and brushes. The new equipment will enable volunteers to continue clearing drains, carrying out minor repairs and re-landscaping erosion on hundreds of mountain paths every year. Andrew Cannon, President of Keswick Lions, said: “As part of the Lions International centenary celebrations each club around the world has been challenged to help to protect their environment. A plaque to mark the donation will be installed on the shed at the National Trust’s Bowe Barn property in Keswick, where the new tools will be stored. James Forrest, Fix the Fells fundraiser, added: “We are incredibly grateful to Keswick Lions for this very generous donation. “The new tools will enable our amazing volunteers to continue repairing and maintaining upland paths in the Lake District’s spectacular fells. “This will have an important environmental impact, removing ugly erosion scars that can be seen for miles, protecting upland habitats for rare plant species, and improving water quality for plant and fish life by reducing sediment run-off. Fix the Fells is a partnership programme between the National Trust, the Lake District National Park, Natural England, Friends of the Lake District and Nurture Lakeland. It exists to protect the spectacular Lakeland fells from erosion by repairing and maintaining the mountain paths. Work is carried out by teams of National Trust Rangers, who work on behalf of the partnership, alongside an army of over 100 volunteers. In 2017 so far Fix the Fells’ 112 active volunteers have gifted 1,193 days of work to the cause, with 424 of these taking place in the Keswick and North Lakes area. Keswick Lions Club is a group of local volunteers who have been supporting worthy causes and community events in and around Keswick for over 25 years. It jointly runs and serves the town’s beer festival, supports almost every youth organisation in the town, and provided significant funds to help re-building work after flooding in the town.